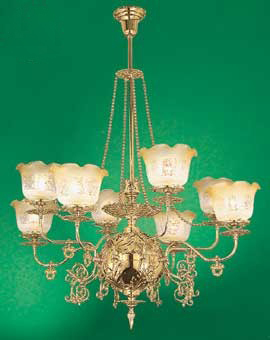 This is a very nice chandelier recreated from originals made by Reliance of Philadelphia, Circa 1890. The large ball in the center of the fixture probably added to the romantic atmosphere with the gas lighting reflecting off its curved surfaces, giving the impression of a chandelier with many more lights than it actually had. At this time is was not unusual to mix two types of gas burners on one fixture. The two different tiers of arms originally held candle lights on the upper tier and wide spread gas burners with shades on the bottom tier. This gave a dual use as low light, and brighter light. Sort of a gas light equivalent of our electric dimmer switches of today. 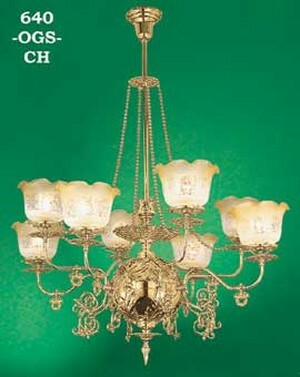 For our chandelier, we chose to make all the arms the same size, but left the two-tier effect. Fixture uses 4" fitter shades. Shades are sold separately. We picture an orange tip frilled edge shade , as a suggestion. See our complete line of 4" glass shades by clicking here . pictured here also are a few charming additions to a room holding this chandelier. 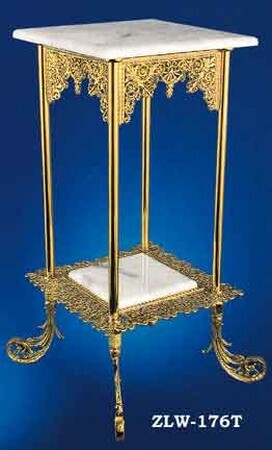 Tie into the beautiful pierced brass detail on the canopy and fitters by using newel post light 299-FGE-NW . We sell many beautiful brass pieces to complement period decor, such as the andirons and marble-top table below. 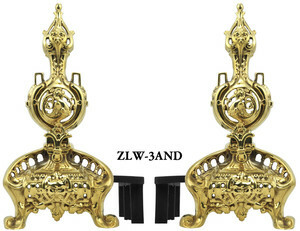 We also sell solid brass door and furniture hardware to match period decor. Adjustable from 46" down to 28" tall. Spread: 39". For shortening, please note that the disk that holds the chains at the stem is adjustable with a set screw making shortening easy. Although the sockets are rated for more, we recommend up to 100 watts per socket, for a total of 800 watts.